A range of Sheetfed and Web Offset duct varnishes for many applications. Aquacoat waterbased coatings produced by GSB Chemical Co. Pty. Ltd. are fast drying protective sealers for application over suitable oil based inks. They can be formulated to produce high gloss levels, through satin finishes to matt finishes. Dependant on end user requirements. The Aquacoat series exhibit very low taint and odour characteristics which make them eminently suitable for the food packaging industry when applied over appropriate low odour inks. The very fast drying property of emulsion coatings enables rapid handling of varnishes prints to be achieved. 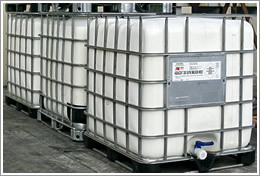 The use of spray powder may be eliminated and when used in conjunction with a hot air knife or warm air blower, high stacks of set off-free sheets can be obtained because these coatings do not contain any hydrocarbon solvents and no emissions which are unfriendly to the environment are released into the atmosphere. Suitable for Wet and Dry Trapping for Board and Paper Stocks. Crystal Satin Sealer Suitable for applications when effective sealing is required without optimum Gloss. Crystal Matt Overprint Varnish Suitable for applications requiring excellent Matte finish with minimum chalking. ECO GLOSS OVERPRINT VARNISH is suitable for Wet and Dry Trapping for Board and Paper Stocks. This varnish is based on Environmentally Friendly Vegetable Oils, with no mineral oils used. Eco Gloss incorporates new Drier technology to give the cleanest colour available. It is also Laser Compatible, suitable for use in most Laser Printers^. Added benefits include Non-Skinning - Overnight Fresh properties, Non -Yellowing and Low Odour. 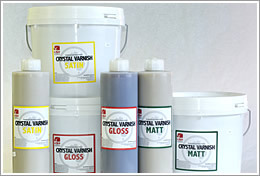 Eco Series Varnishes have no known health affects when used with reasonable care and with accepted industrial practice. ^ - GSB Chemical Co. Pty. Ltd. advises the product be tested for suitability for Laser Printing, prior to running live job. ECO MATT OVERPRINT VARNISH is suitable for Wet and Dry Trapping for Board and Paper Stocks. This varnish is based on Environmentally Friendly Vegetable Oils, with no mineral oils used. Eco Matt incorporates new Drier technology to give the cleanest colour available. It is also Laser Compatible, suitable for use in most Laser Printers^. Added benefits include Non-Skinning - Overnight Fresh properties, Non -Yellowing and Low Odour. ECO SATIN OVERPRINT VARNISH is suitable for Wet and Dry Trapping for Board and Paper Stocks. This varnish is based on Environmentally Friendly Vegetable Oils, with no mineral oils used. Eco Satin incorporates new Drier technology to give the cleanest colour available. It is also Laser Compatible, suitable for use in most Laser Printers^. Added benefits include Non-Skinning - Overnight Fresh properties, Non -Yellowing and Low Odour. Specialty Varnishes GSB also produce a wide range of specialty varnishes. Some of these products include Perfecting, Scratch Off, Low Tack and Micro Encapsulating varnishes.